Andrew Hughes believes it is too early to say Preston North End are in a relegation battle. The Lilywhites reamined bottom of the Championship after going down 3-2 against West Brom at Deepdale on Saturday as the Baggies went to the top of the pile. Alex Neil’s side have not won since the opening day and have now lost their last four in the league. 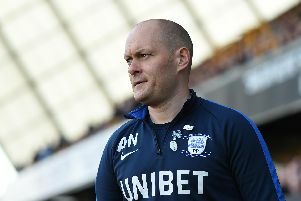 “I think it’s a bit early (to say it’s a relegation battle),” said Hughes, who scored his first PNE goal in the latest defeat. “We’ve got to try and stay positive and everyone needs to stay together. “The changing room is right behind the manager and everyone is supporting each other. “There’s no problems on that side. “The last two performances have been really good and we’ve been unlucky not to get a result. All the goals came in the second half on Saturday as PNE again came out on the wrong side of a high-scoring game. Hughes’ first North End goal was a well-taken low free-kick which levelled things up at 1-1 after Jay Rodriguez had opened the scoring just after the interval. Ben Davies’ unfortunate own goal put the visitors back in front before Dwight Gayle’s free-kick all but made sure of the points, Alan Browne scoring a late consolation for North End. “I’ve been practicing free-kicks in training and it’s nice to see one come off,” said Hughes. “It was a bit close to go up and over so it was a case of hitting to the side where the wall wasn’t and seeing if the ‘keeper gambled. “It’s always a positive to get off the mark but it’s all about results now. West Brom’s second came via a large slice of luck, Davies getting his head on Craig Dawson’s cross only for it to loop over Chris Maxwell and in. “At 1-1 you think there’s only one team going to win that with the momentum we had,” said Hughes. “Then it flips around so quickly. “From that angle that’s the only place that it can beat the ‘keeper, in that far top corner. “It’s just little things like that which just aren’t going our way at the moment. “If it goes out for a corner or a throw-in we aren’t having this conversation.